This is a restaurant recipe for Fish with Lemon Hazelnut Sauce that is flexible in terms of the fish you use. I often use cod or halibut because they are normally available where I live and where the restaurant is located. Any white fish easily available to you would be good with this recipe. Cod is the common name for three species of fish ( Atlantic, Pacific and Greenland ). 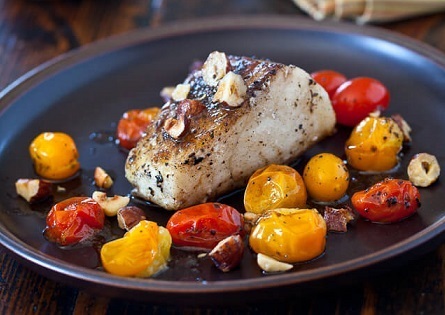 Cod is a popular fish with a mild flavor, low fat content and dense white flesh that flakes easily. The cod market has been flourishing for over a thousand years. Halibut is found in both the North Pacific and North Atlantic Oceans and is a highly regarded fish for food. Halibut is typically broiled, grilled or deep fat fried. The fillets can also be smoked but this is more difficult than it is with salmon due to the ultra-low fat content of halibut. Eaten fresh, the meat has a very clean taste and is easy to consume with little seasoning but it, as with cod, can be easily enjoyed with sauces, butters and herbs. If you like more hazelnuts you can do one of two things. Add more hazelnuts or "encrust" the fillets in well-chopped hazelnuts. Plate the fish and drizzle with the sauce. Serve it with rice or potatoes and one of the vegetable recipes on the website. 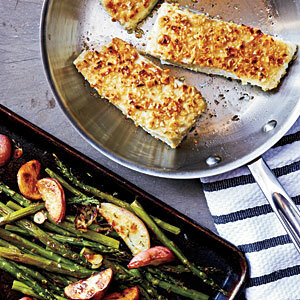 Enjoy this White Fish with Lemon Hazelnut Sauce recipe and the company of those you share it with! Enjoy all the real restaurant recipes on the website!